The stereotactic breast biopsy technique is a minimally invasive procedure that is useful for small lumps and microcalcifications that cannot be felt, but are detected on the mammogram. This method involves combining the mammogram and computer technology to localize the area and draw out cells for analysis. To perform the procedure, you will lie face down on a table with a cutout for your breast. 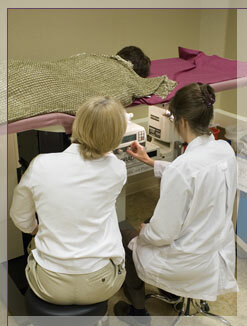 The breast is compressed into a small mammography machine and several images are taken. The computer program along with the films taken, guide the physician to the exact biopsy location. Using local anesthesia, a very small incision is made and a special probe is inserted through the incision. A vacuum is attached to the probe and the probe is rotated 360 degrees, and tissue samples are taken at various location. Following the biopsy, a small sterile strip and an ice pack is applied to the incision. Please arrive about 45 minutes before your scheduled procedure time. We will need this time to complete registration and to prepare you for the procedure. If we do not have your mammography films, please bring them with you. Wear a comfortable two-piece outfit; such as you would for a mammogram. You will be asked to undress from the waist up and put on a short robe. Do not put lotion or cream on your breast the day of your procedure. Please do not eat for about 2 hours prior to the procedure. You will need to lie on your stomach and a full stomach may make you uncomfortable. Plan to rest at home for the remainder of the day. Going back to work is not advised. Do not take aspirin, naproxen, or ibuprofen for one week prior to your appointment. Please ask for special instructions for other blood thinners, such as Coumadin, Warfarin, or Plavix, if you take any of these drugs.